1. Going to take advantage of this light week to go through some of the photo stash. I thought of doing a Poet’s Landing update, but because LeChase is mostly working on site clearing/prep and excavation at this point, and given the snow on the ground, it didn’t seem like there was a whole lot to be gained from making a unique update. But, rest assured, it’s still underway, there’s just not a whole lot to see at the moment. Once the snow melts off, the slab foundations work should be visible, and there might even be some framing going up by mid-winter. 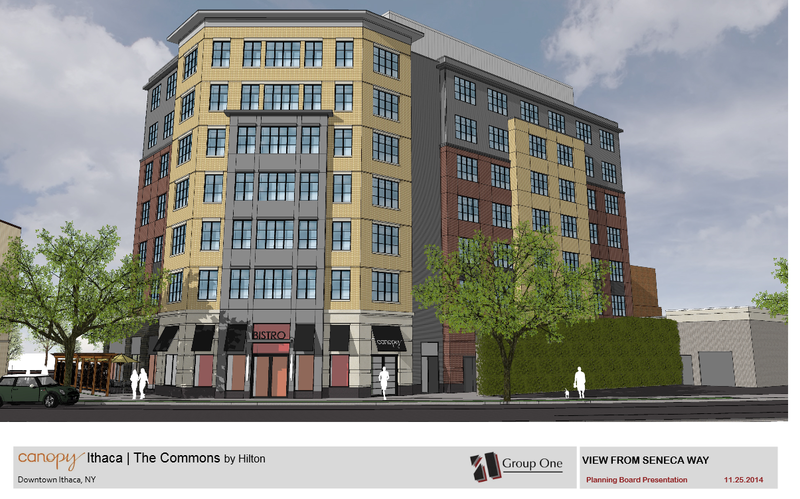 The six new apartment buildings and their 48 units should be ready by the fall of 2017. 2. 107 South Albany in the city is another one that doesn’t merit its own post just yet, but work should be taking place at some point soon. The building permits have been filed with the city for the 6-unit, 9-bedroom renovation and addition to the rear of the existing building, and from peering inside the existing windows, there’s the impression that interior demolition work could be underway – could explain the broken window on the second floor at least. There was no excavation work yet in the backyard, where the new wing will go. 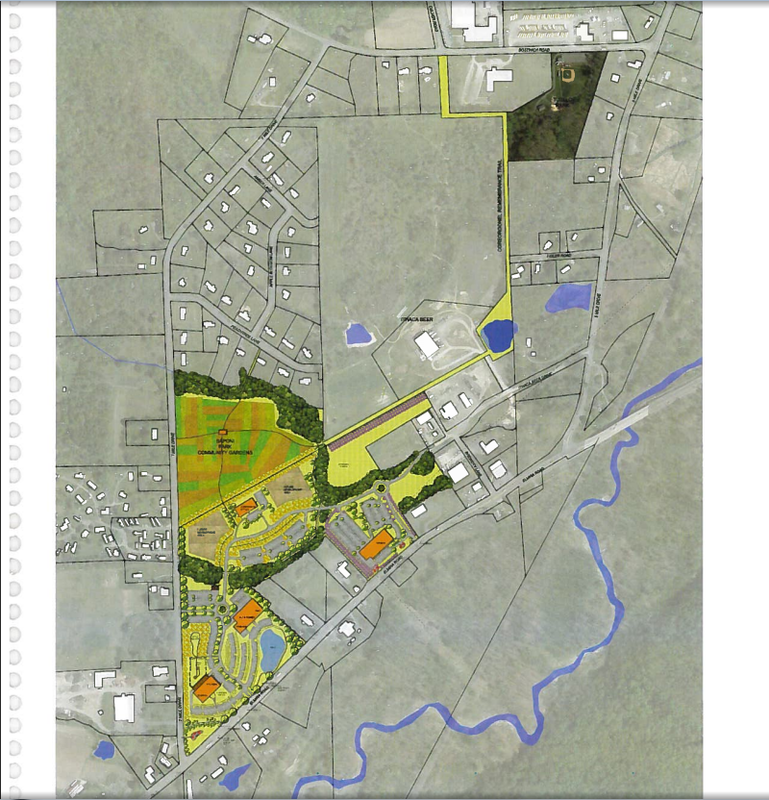 The Site Plan Review document says July 2016 to August 2017. Maybe there will be something to talk about by the next round of downtown updates. 3. Some folks might remember Phoenix Books, the hard-to-miss barn bookstore off of 366 as one approached Ithaca from Dryden. The store closed last year after 30 years of business, and the barn itself is about a century old. Now the property at 1608 Dryden Road is for sale. The barn, a small outbuilding, and 29.3 acres for $229,900. According to the Zillow posting, a sale is already pending. The Iacovellis used it to house their construction equipment, and had it on the market for $409,000. It sold for just under that, a reasonable $400,000, to Greentree Garden Supply, which has operations a stone’s throw away from the property. Greentree makes their own soil products (potting soils, soil formula), so that may be a potential future use of the warehouse they just picked up. Good for them; they seem to be thriving as well as their garden plants. 5. Here’s a cool idea – the Lansing School District is planning to build an outdoor classroom as part of $4.95 million in renovations. Cassandra Negley has the full story at the Times. 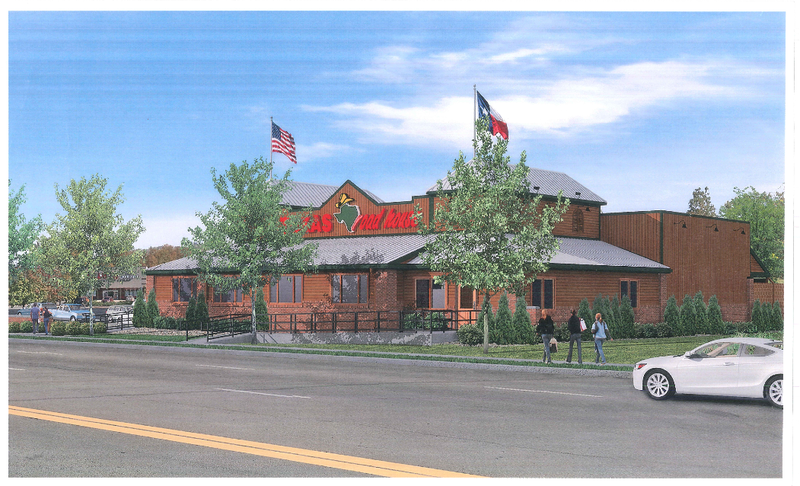 The renovations were approved by a landslide 240-32 vote, which was helped by the fact that the project will be funded with grants and money from the school district’s reserve (rainy day) fund – no additional cost will be assumed by the taxpayers. In advocating for the project, school district staff noted that it would provide for “multi-sensory experiences”, a useful asset during the instruction of natural and environmental science topics, and cited studies that showed students performed better academically when given the opportunity to have classes in outdoor spaces. The space would be used as covered play space during recesses. 6. Going off into hand-waving territory here. Enter at your own risk. You might have heard in the news this week that New York State, even though it added 104,500 jobs over the past year, is estimated to have recorded a population loss of about 1,800 people. That’s not a good thing for a number of reasons, but it’s a more acute issue upstate. New York City issued building permits for 101,705 residential units from 2013-2015, with another 13,000-14,000 estimated this year, and the city, just the boroughs and not even counting the suburbs, makes up nearly all the population growth (375,272 through July 2015, vs. 367,179 as the total gain for the state from 2010- July 2016). Upstate continues to hemorrhage people to other states. Not a surprise to anyone who’s travelled outside of Ithaca, Saratoga or the few other bright spots. What can we expect for Ithaca in a bad piece of news for Upstate? Here are some off-the-cuff tallies for population growth. 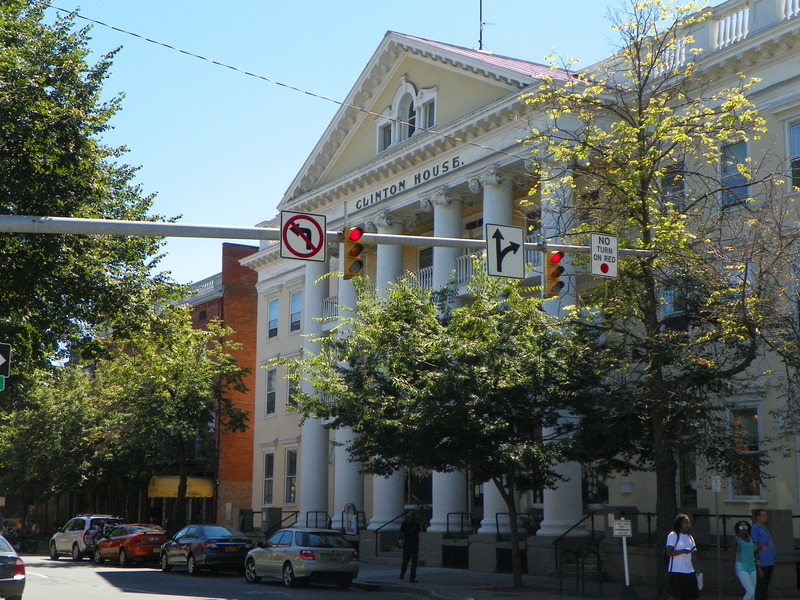 Ithaca’s estimated to be 30,788 as of July 2015, up 774 since 2010. The estimates due out early next year cover July 1, 2015 to July 1, 2016. What opened in that time frame? 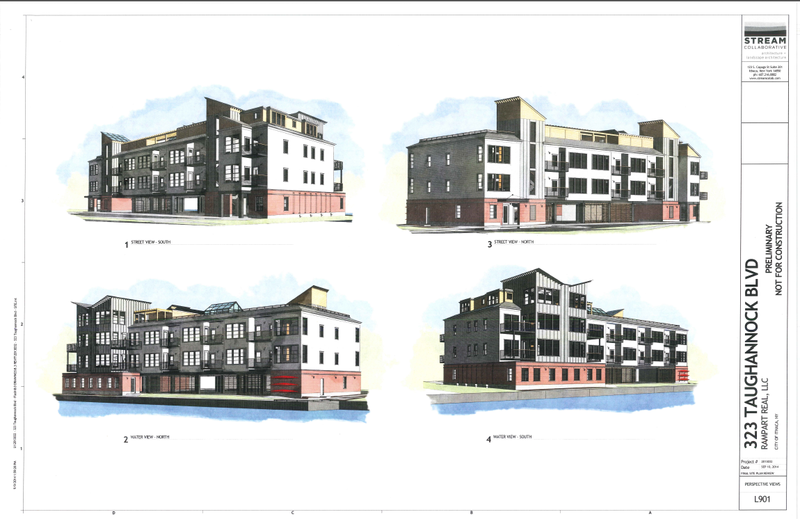 By my count, Stone Quarry (82 beds), the Lofts at Six Mile Creek (66 beds), 804 East State (18 beds), 707 East Seneca (18 beds), 206 Taughannock (10 beds), the Lehigh Valley House condos (6 units, will assume county average 1.7 occupants per unit, for 10 residents), 116 Catherine Street (17 beds), and the 140 College Avenue (12 bed addition). Allow another half dozen or so units with a dozen beds total, for accessory apartments or new single-family homes. 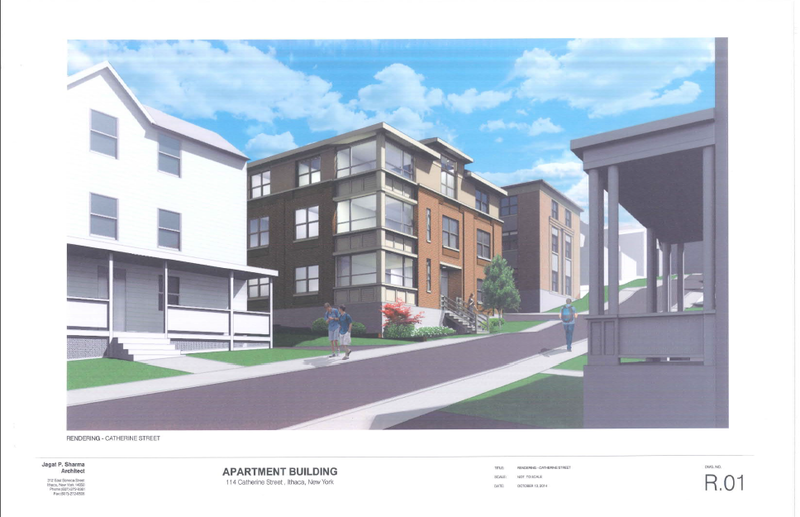 Only one of these projects replaced existing housing units – a one-bedroom bungalow came down for 804 East State. The gross gain is about 244 people, if we assume the standard of one person per bedroom or studio unit. Now let’s do some subtractions. Hughes Hall closed on Cornell’s campus. -47 off the bat, for 197. Now, the math can’t easily accommodate those who had a household member move in/be born, or move out/pass on. But trends suggest a 2% decrease per decade, so we’ll treat it as negligible. So, my baseline prediction for the 2016 estimate is 30,981. 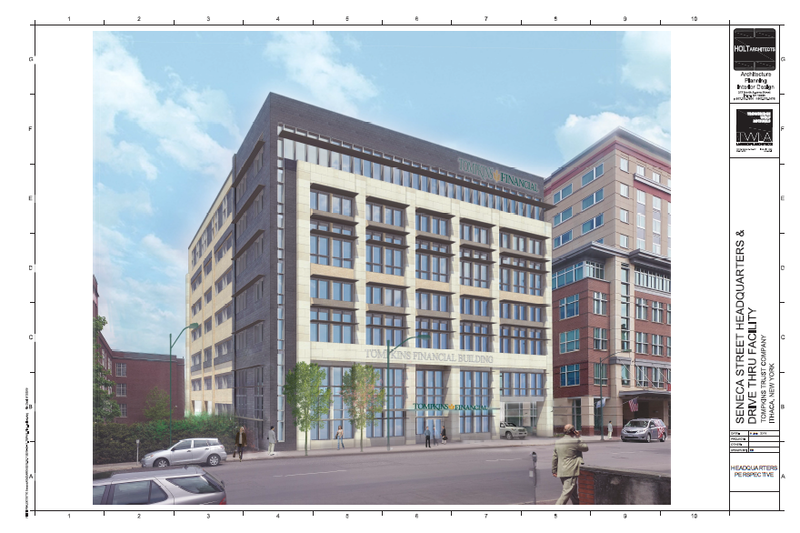 Just thinking offhand of the projects that have opened since July 1, 2016, expect at least 210 more for the July 1, 2017 estimate, and 670 in 2018, because that’s when Collegetown Terrace phase III (344 bedrooms), Novarr’s townhouses (net gain ~60 bedrooms), 210 Hancock (90 bedrooms) and Todd Fox’s latest trio (net gain ~110 bedrooms) are included in the figures. These drive-by numbers are based just on what’s underway, or approved and financed. The 2017, or more particularly the 2018 numbers could go up. So roughly, 30,981 in 2016, 31,191 in 2017, and 31,861 by July 1, 2018, assuming no major catastrophes and that the local economy’s growth and residential vacancy rate is consistent. For the record, the purely mental figure I use for a 2020 census is 32,500. 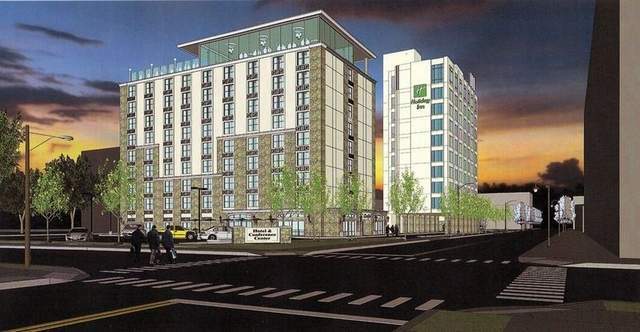 That would consider Harold’s Square (146 bedrooms), City Centre (250 bedrooms), the first phase of Chain Works (80+ bedrooms), as well as other proposals that may arise in the next year or two and open before April 1, 2020, the official census date. I do not factor in any new Cornell North Campus dorms in the estimate, since the new dorms will initially function as temporary replacements for existing space that will be concurrently closed and renovated. Now, when thinking about the town of Ithaca, things get really weird because of Maplewood – a loss of 370-380 beds. 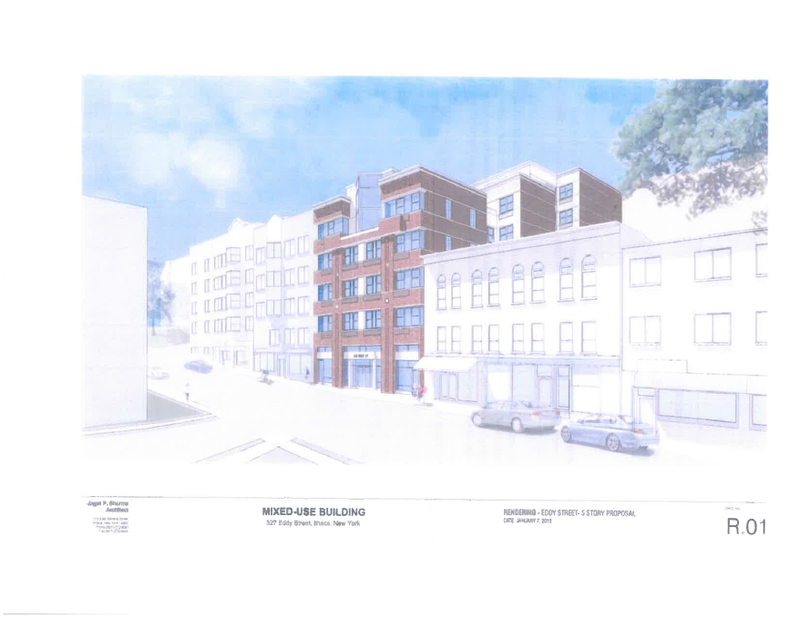 The town doesn’t have any large multifamily underway – my partially-imputed count from permit reports gives about five newly-occupied duplex units and 20 or so homes for the July 2015 – June 2016 period, and the 10 Belle Sherman townhouses. That’s probably 100-120 beds total. The town of Ithaca will likely show a decrease in population in the 2016 census estimate because of the Maplewood closure, and it will be bad optics because there’s all this talk of affordable housing issues, and seeing a decline in population in the news will inspire a negative kneejerk reaction – either “if it’s going down do we really need housing”, or “hey, it’s going down, then why are the rents so damned high”. Have that talking point ready, Ithaca town board. For the 2017 count/2018 release, the partially-educated guess is an increase of 150 given Brookdale, but the 872 new Maplewood residents won’t come into count until the 2018-19 estimation period, at which point we’re pretty much at the next census. I’m thinking around 21,500 for 2020 (from 19,930 in 2010), if the current trends continue and major housing projects are completed. Seven years. The amount of time it takes to master something. Today, Ithacating celebrates its 7th birthday. It was started in a dimly-lit bedroom on a cool, rainy evening on June 18th, 2008. I’ve made the comment before that I’ve never written the birthday entry in the same place – until this year. Most of it was written the evening of the 16th at home, with a quick check of the numbers at lunch before scheduling its publication. In previous years, the blog averaged 82, 166, 199, 216, 182 and 155 hits daily. The numbers look a little more dismal than they are; the blog had a large downturn in traffic starting around February 2013, and only started to experience an uptick again in February 2014. The upswing has continued for a lot of the past year, with some months setting all-time records in late 2014 and 2015. This year, as of 11:52 AM EDT, 445,292 hits have been received, about 219 hits per day. 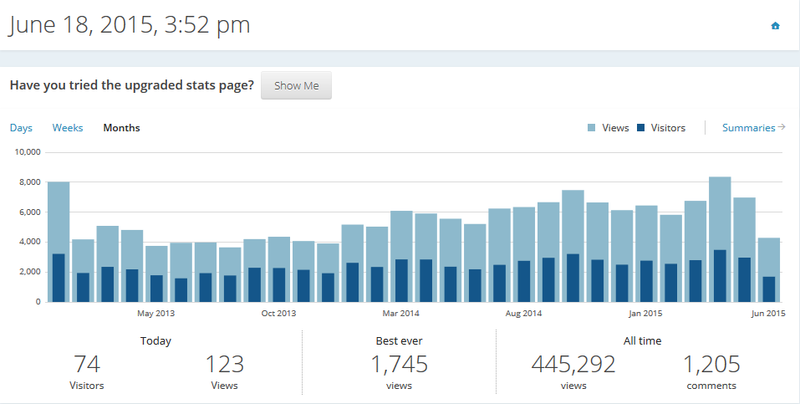 In other words, the most traffic I’ve ever received has been in the past 12 months. I owe a lot of that to the Ithaca Voice. The biggest change over the past year has probably been the Voice and its relationship with the blog. The Ithaca Voice launched only three days before the 6th birthday post, so its impact was yet to be meaningfully quantified. Looking at the numbers, the Voice has referred 1,108 viewers (vice-versa, Ithacating has referred about 116 viewers to the Ithaca Voice). Some pieces on the blog are “syndicated” in the Voice, and once in a while vice-versa; but there are articles and posts that are exclusive to each, so one has to be reading both to see everything. Partially for my own time management, I set a formal publishing schedule for the blog – a news roundup on Friday nights, and a “topic of the week” on Monday nights. This gets suspended for photo update weeks, because those are much quicker to write. I still get occasional visitors from Ithaca Builds (281), which I miss, although I’m happy for Jason and his pursuit of an MRE at Cornell. And although I tend to share historical photos more than blog posts on Twitter, that’s contributed about 1,449 visits over the past year, making it the second largest source of visitors after search engines. It’s still remarkable to think about the changes that have happened to this blog over the past seven years. This was originally a Cornell blog for the most part. Cornell news, Cornell facilities and Cornell history. However, I started to exhaust myself of ideas, and the Ithaca development entries, which weren’t a big focus in the first couple years, began to take up a larger proportion of the subject matter. I cringe when I look at some of the oldest entries. The quality of writing and the over-opinioned screeds are atrocious. Slowly working my way into different subject matter changed viewing patterns; the huge summer dip hollowed, but I stopped getting such a large spike in January when the Greek system’s rushees came back to Cornell. But I’m still very self-conscious of what I write – facts are double-checked and opinions have been muted, especially write-ups in the Voice. I jokingly refer to pieces as “blog-appropriate” and “Voice-appropriate” depending on how colloquial my writing is and how much of my opinion shows. I spent five years writing semi-anonymously, and only this past year have I really engaged with many of the people I write about – architects, developers, politicians and officials. There are definitely times when I feel out of my league, and to find out these people read the blog is both motivating and anxiety-inducing. I don’t consider myself especially knowledgeable about Ithaca building projects and urban planning, but I like to think that I’m good at finding information and writing about it. 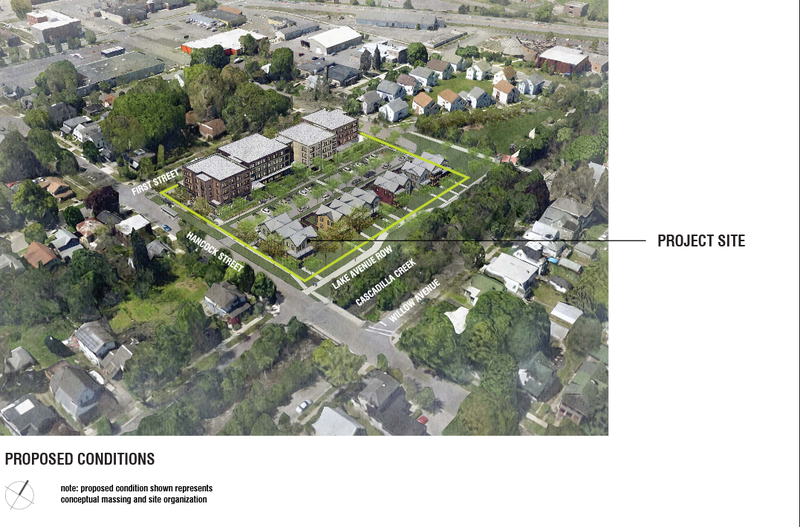 My favorite entries over the past year are the ones where I can combine history and development – the 10-story building once proposed for Stewart Avenue, the Collegetown history series I did last year, and that time Cayuga Heights stopped Cornell from building dorms. There were still a few Cornell-centric pieces – a biography of Cornell’s incoming madam president, a history of Cornell’s ladder-climbing provosts, Cornell’s logo failure, and dogs at Cornell. There were also some new fast facts entries, including a couple for Ithaca College. Looking at construction projects over the past year, a few projects were completed, or are about to be completed. The Lofts @ Six Mile Creek has gone from a foundation to near completion, Planned Parenthood wrapped up its new building, Ecovillage is ready to open their new apartment building and Stone Quarry is nearly finished. 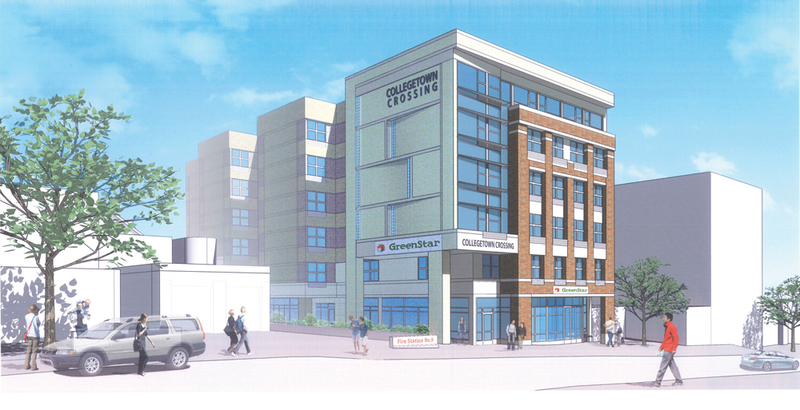 A few smaller projects, like 140 College Avenue in Collegetown, are also nearing the finish line. A few projects were approved. Some have started, or are about to start construction – 114 Catherine, 327 Eddy, 307 College and 205 Dryden in inner Collegetown. Elsewhere, there was 707 East Seneca, the downtown Marriott and Canopy Hotels, and the Carey Building. 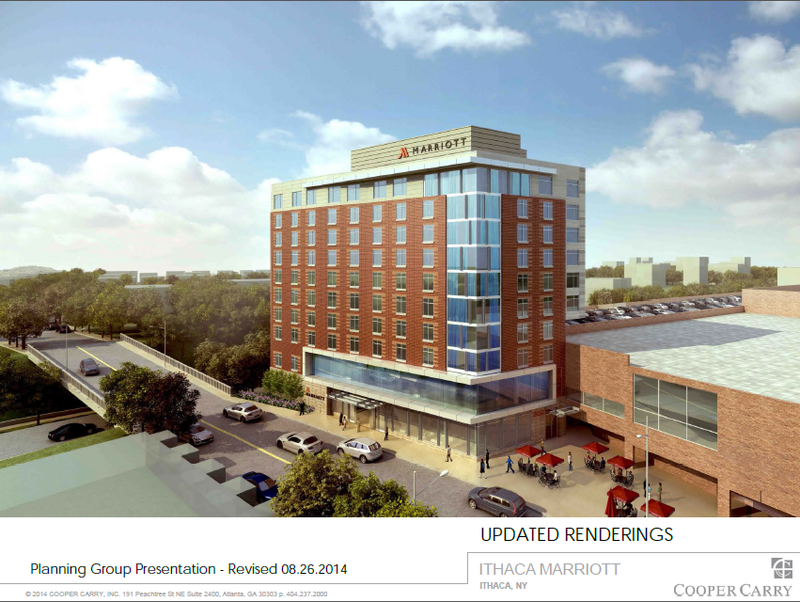 Still others are awaiting financing, like 323 Taughannock and the Hotel Ithaca. 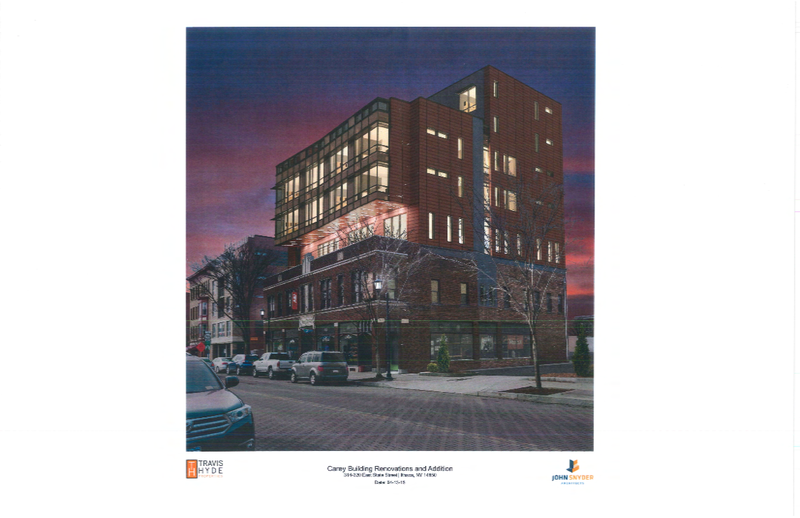 A few more projects were proposed – more Collegetown housing (some more likely than others), the Tompkins Financial Corporation HQ, 210 Hancock, 215-221 W. Spencer, and a Texas Roadhouse. Oh, and let’s not forget State Street Triangle, which will probably be a lightning rod of attention as it goes through the review process. Lastly, a few projects also met their demise. 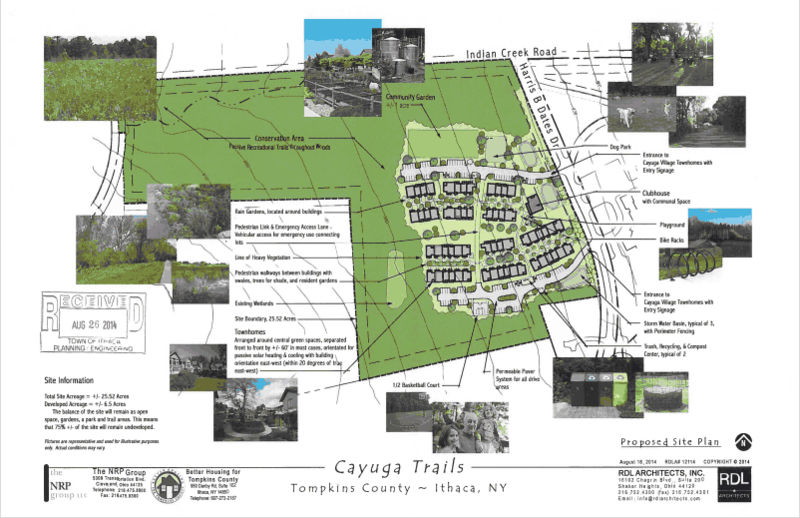 7 Ridgewood, a hotel for 339 Elmira Road, and the Cayuga Trails and Troy Road housing developments in Ithaca town. 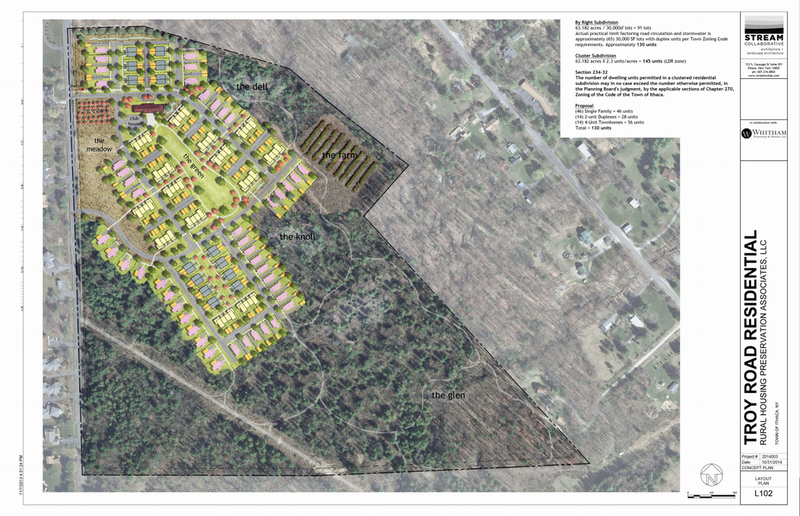 The town also recoiled from the Maguire HQ Plans, for now at least. Over at Cornell, the Hotel School finished their new entrance and addition, the Gannett expansion started construction, Klarman Hall continued to plod towards completion, and the “Sesquicentennial Grove” was planted. Cornell announced plans to renovate Upson Hall and Rand Hall. It’s been a busy year, and even CNN noticed. But it gives me plenty to write about in the news round-ups. I won’t issue a Friday night post if there are less than four news items, and that’s only happened a few times in the past year. So, here I am. It’s been seven years, but I wouldn’t call myself a master of anything (except puffy cloud studies). In late April, I received a job offer in Sacramento. I was sudden, and only a couple close friends and family knew about it. Two years ago, I’d have taken it without question. A year ago, probably yes. But (after a stressful weekend of debate) I turned it down because it no longer felt like the right move at the right time, which has led to some soul-searching about what I want and don’t want. It’s not easy to articulate. I dunno where things will go moving forward. In life or in blog. But I’ll keep writing as long as I enjoy it. Unlike the other posts in the “Fast Facts” series, this information comes from Cornell Postgraduate Surveys conducted by Cornell Career Services. Let’s be frank. People generally don’t go to college these days for educational enlightenment. It’s all about the return on investment, and that holds true for a school like Cornell. 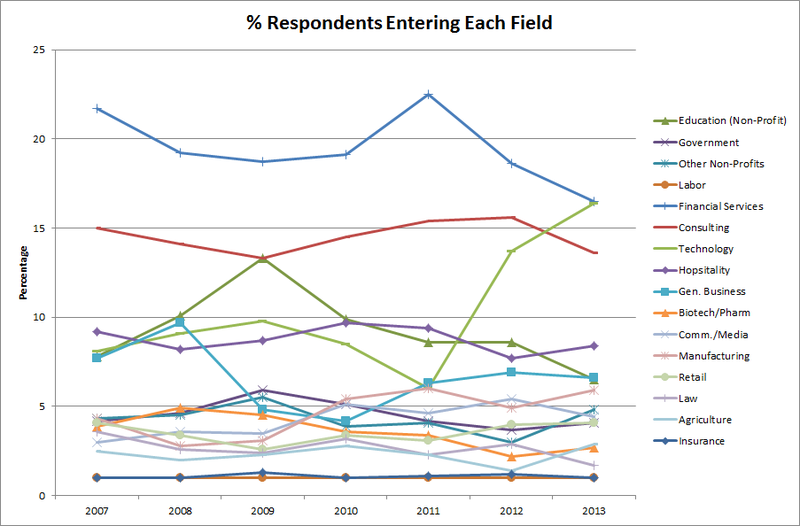 Here’s a look at some of the stats, courtesy of Cornell’s postgraduate surveys. Big disclaimer here – the response rate to these surveys is 70-75%, and I’m going to go out on a limb and suggest that the kids who find themselves with some motivation or bragging rights are probably the ones most likely to respond. Who wants to tell Cornell they’re living in Mom and Dad’s basement? With that disclaimer aside, here’s the cold hard cash stats. These charts leave off the class of 2014 because they have six months to submit info – until the end of the month, in other words. Looking at the past several years, we can definitely see the influence of the 2008/2009 recession. “Other Endeavors” includes, travel, volunteer work, and actively seeking grad school/employment. This value has climbed by a third since 2008. 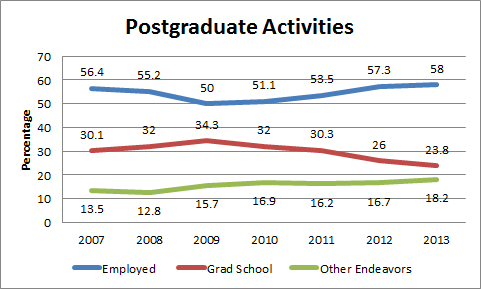 The number of those attending grad school continues to drop from its recession high, while employed grads have rebounded. There’s a well-documented inverse relationship between the economy and grad school enrollment – people want to make that cash when the economy’s good, but they hunker down and work towards advanced degrees when the bear market is growling. 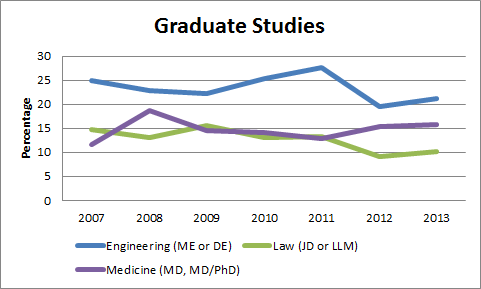 Of those pursuing graduate studies, the top three, which are consistently the top three, are Engineering (M.Eng), Law School and Medicine. Law school has taken a hit in recent year due in part to the law school bubble bursting. The return on investment just isn’t what it used to be. 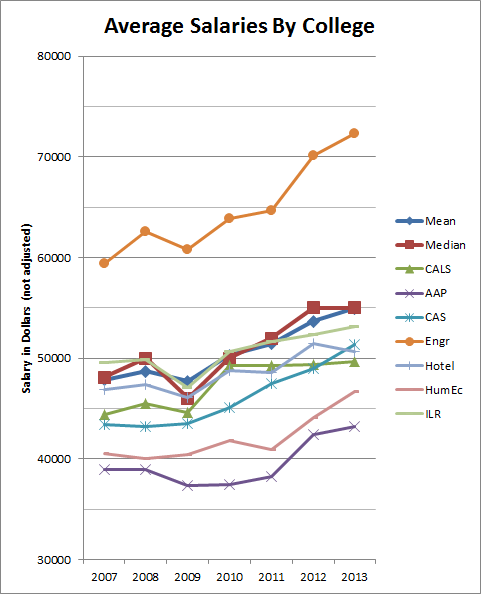 Now some real meat – mean and median salaries for the university as a whole, and for each college. 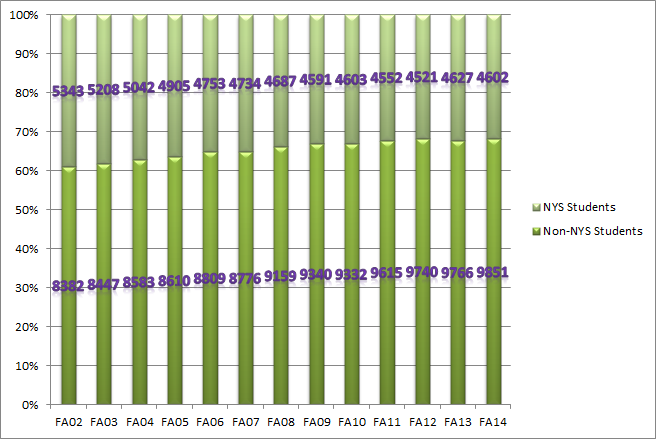 Both mean and median are right around $55k, helped substantially by those engineering salaries. Electrical/Mechanical/Computer Engineering pays, kids, if you can survive the four-year blow to your self worth (looking at you, Diff Eq). AAP is well below the average, pulling just over $43k in 2013; but AAP students also respond to the survey in smaller numbers, often only 40-50%. That could be a good thing (unreported high salaries) or a bad thing (living in Mom’s basement and too embarrassed to respond). Cornell breaks down respondents by the type of work they do. The big ones are financial services (I-Banking) and consulting (more financial work), which pull in 30% of the graduating class. In more recent years, “Technology”, your Google, Twitter and tech startup employees, has been booming, thanks to rapid growth and rapid rise in pay. If the last tech bubble burst in 2000/2001 was any indication, the number pursuing technology jobs will drop significantly when a market correction occurs. 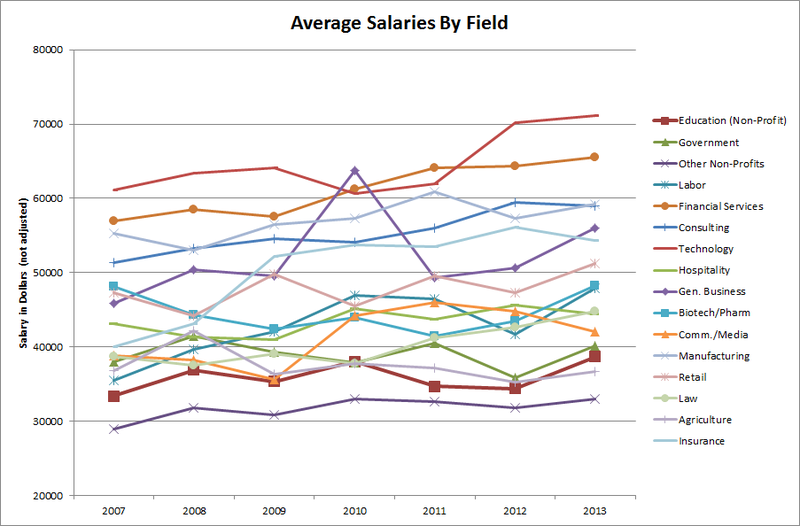 But in the meanwhile, tech is at the top of the average salaries graph, followed by our friends in banking. Coming as no surprise, the graph shows working at a non-profit pays relatively poorly. There does seem to be a direct relationship between how boring/morally ambiguous a job is and how much one gets paid. 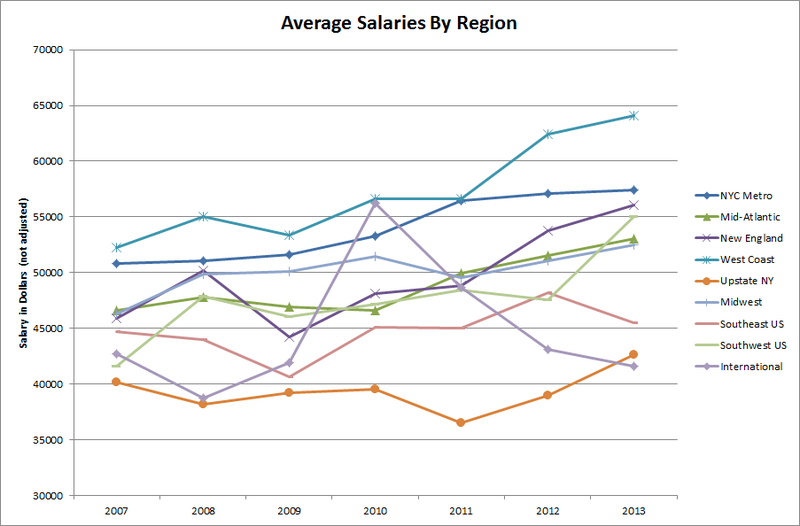 Lastly, average salaries by region. The West Coast (think Silicon Valley) leads the pack, followed by the always-expensive NYC Metro. Upstate New York is at the bottom, perhaps because 1) it’s a cheap place to live, and 2) the jobs in upstate don’t tend to be high-end finance or tech jobs; agriculture and education would be more likely. I can personally vouch for the West Coast being expensive; I was once offered a position in California that I estimated would incur an extra $20,000 in living expenses for things like rent, and the offered salary reflected that (I also discovered after they flew me out there for the interview/offer how much I would dislike the job, which threw me into a personal crisis…a fun story for another day). Unless otherwise noted, all source data comes from the Cornell University Factbook. For this, I’m only going to focus on the undergraduate population. When I was a student at Cornell (oh, for those halcyon days of the late 2000s…yes, I am joking), there was a quip that 38% of the students come from New York State, but 90% of them are from New York City and its suburbs. An exaggeration, but the large presence of Westchester and Nassau and the like was forever a source of tension, if only a minor one. With access to Cornell’s enrollment figures, we can see by just how much downstaters dominate the student population. For anyone from outside of New York, this post probably won’t be a whole lot of interest to you. But for the kids that want to play along at home, here’s a map of the counties of New York, all 62 of them. In what should be a surprise to absolutely no one, Nassau County on Long Island and Westchester County comprise the largest sources of Cornell undergrads – 654 and 607 students respectively. Given 14,453 undergrads in fall 2014, that means these two counties alone account for 8.72% of the UG population. NYS students number 4,602 of that 14,453, 31.84% of the student body. If we define downstate as Orange, Putnam, and everything south (the definition of where upstate and downstate divide is fraught with contention, so I’m going with a rough middle ground), then downstate comprises 2,971 of those 4,602 students, 64.56%, or just under two-thirds. 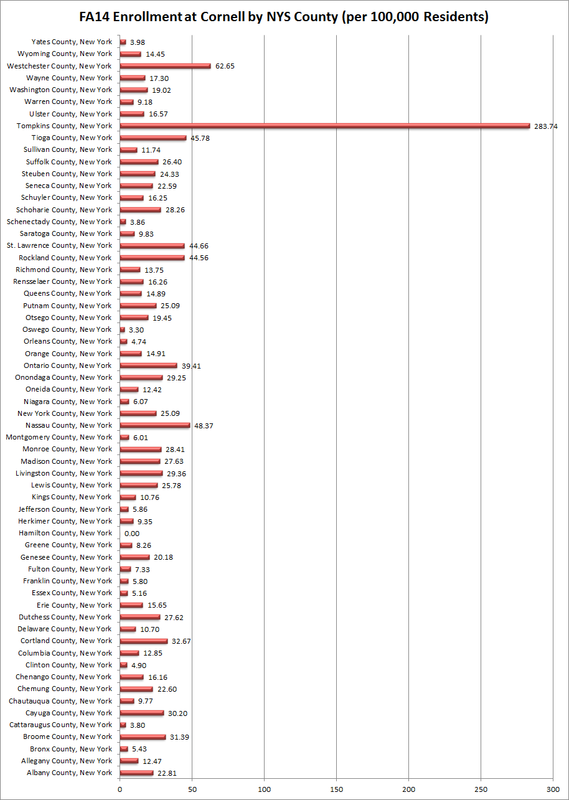 Only one county has no representation at Cornell – Hamilton, which has only 4,773 residents (2013 estimate), the smallest population for any county in the state. Now, I can already hear the commentary now – “BC, you misleading and ignorant a–hole, these numbers should be presented per capita.” Way ahead of you, irritable dear reader. 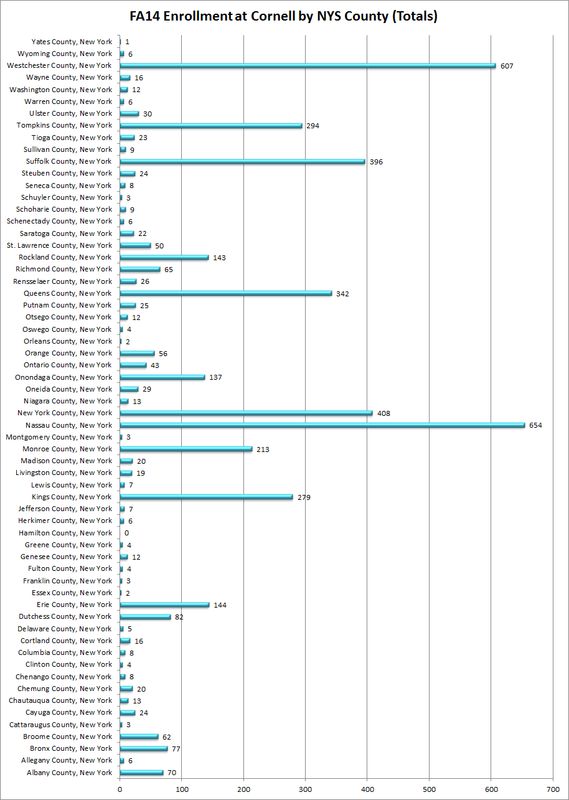 I downloaded the 2013 county census estimates and decided to do a little data magic, looking at enrollment per 100,000 residents of a given county. Tompkins dominates, no surprise there. Westchester is next, showing that living in a county comprised of mostly affluent, tony suburbs with school districts to match is handy for getting into the Ivy Leagues. From there, we see it’s a mix of New York City’s affluent suburbs and counties close to Tompkins – though St. Lawrence, up by the Quebec border. is something of an anomaly. One more thing I wanted to write up before concluding this post, which really only scrapes the tip of the iceberg. The percentage of NYS students continues to decrease as the enrollment increases, as shown below. In fall 2002, 38.93% of students came from NYS; in fall 2008, that number shrank to 33.85%; and by fall 2014, 31.84%. I have no idea if the state has any sort of minimum number or floor percentage that Cornell must adhere to, but if the trend continues, I could imagine some legislators pushing for one. In sum – the 38% value hasn’t been accurate since 2002, so that quip was outdated by the time I started my time at the Big Red. The 90% value is also a little high, but there’s definitely a large contingent of NYC suburbanites in the student population, and it doesn’t see, so large when broken down to per capita values.